It was long over due. 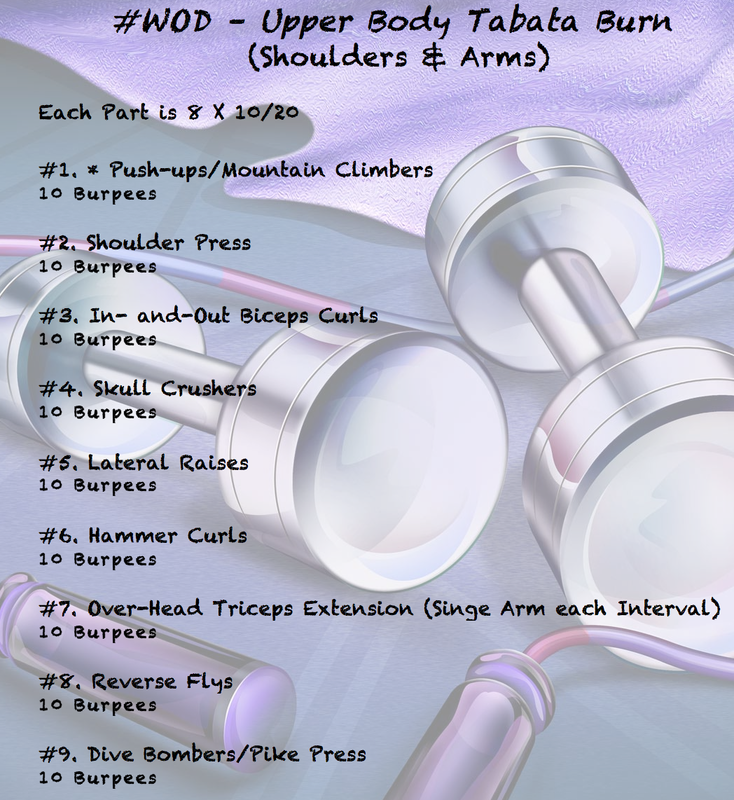 The second workout from the Tabata series - Upper Body (Shoulders & Arms) Burn. You can do it on the day after the Tabata Lower Body Burn or anytime you need an intense Shoulders and Arms Workout. It is comprised of #9 parts. The first part is more of a warm-up, to get your muscles ready for the high demand of the intense load to follow. Each part is in Tabata Protocol - 8 X 10/20 (total of 4min) with 10 Burpees in between. Try not to take longer than 1 minute rest after the Burpees. This workout shouldn't take longer than 45min (depends how fast you are with the Burpees and how long is your rest). If you are in a "Best Mode" you can add a Knee Jump Tuck to the Burpees. The only equipment you will need is a good pair of heavy dumbbells. Part #1: Comprises of two (2) exercises. You have to alternate them until the intervals are finished (total of 4 times each). Part #3: In-and-Out Biceps curls - Perform one rep of Biceps Curl with forearms parallel, next rep with forearms on 45-degrees out. Part #4: Skull Crusher - You might know this exercise as a "Lying Triceps Extension". Lying in Supine (face up) position on a bench or the floor, arms extended to the ceiling, parallel, palms facing each other, elbows tucked in. Lower the dumbbells by bending your elbows until they reach to the floor, aside your ears. Lift back up to the starting position, keeping the elbows tucked in and using the triceps to do the work. Repeat. Part #7: Over-Head Triceps Extension - Each arm is done separately. Alternate the arms on every interval (total of 4 times each). Part #9: As in Part 1, we have two (2) exercises that you have to repeat until the intervals are are finished. Don't forget to use weights that will be challenging. I can guarantee you that at the end of each part your arms will be shaking and the muscles burning. Have lighter weights near, if you need to change. And the most important is to have fun. If you have any questions, leave a comment in the box below, I'll come back to you ASAP. Enjoy!